Further to the earlier post, I have now completed 5 rows for this mysterious wall hanging. I have gone “off piste” slightly as the original design includes a row of pieced houses interspersed with trees. As all my other rows have a Cream background I felt that to break the continuity by adding a row with Blue sky background would be inappropriate. I have therefore repeated my favourite row of mini hexagon flowers. I checked the overall length of the longest row and adjusted the length of the shorter ones by adding a little extra Cream calico fabric. 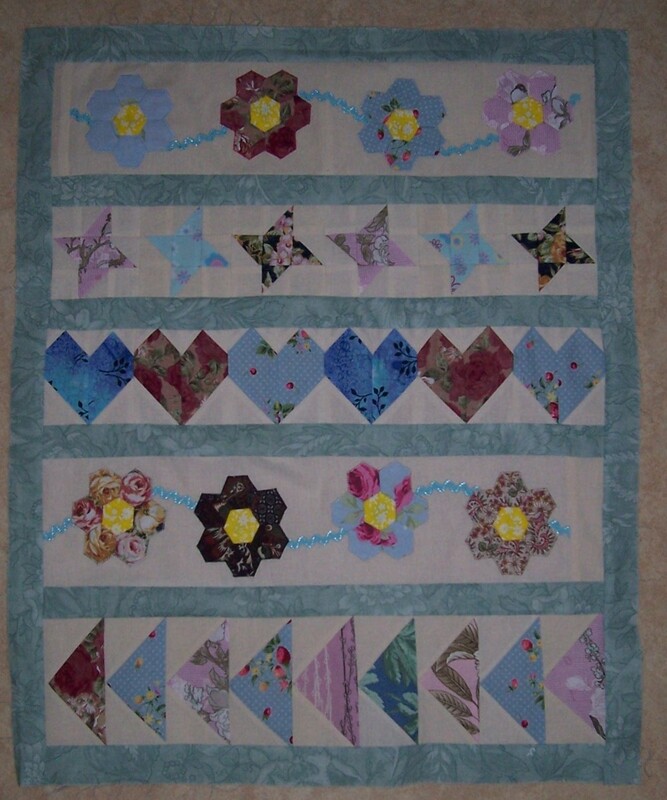 I hope to cover the joins with additional applique and I will also add further detail to the blank spaces in the row of Friendship Stars (row 2). 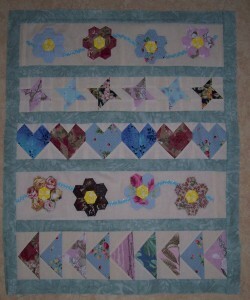 Each row has been separated from the next with a strip of sashing which is also used for the first border. The hanging now measures approximately 21″ wide x 25″ long but this will be increased with the addition of a second border and binding. Next step is to finish the front before making the quilt “sandwich” of wadding and backing before quilting and finally adding the binding. I have enjoyed this project which has given me the opportunity to practice new techniques and use up just a little of my stash of scrap fabrics.